The Arthur Hills Course at Palmetto Dunes Oceanfront Resort takes full advantage of the natural beauty of the South Carolina Sea Islands. The Hilton Head, SC golf course design blends the topographic beauty of the Lowcountry with the inherent challenges of the game to produce a unique golfing experience. Because it was built on a series of rolling dunes, the Hills course presents many opportunities for off-balance lies. A continual ocean breeze adds yet another element of challenge to the game. And, finally, 10 holes on the water encourage precision play. 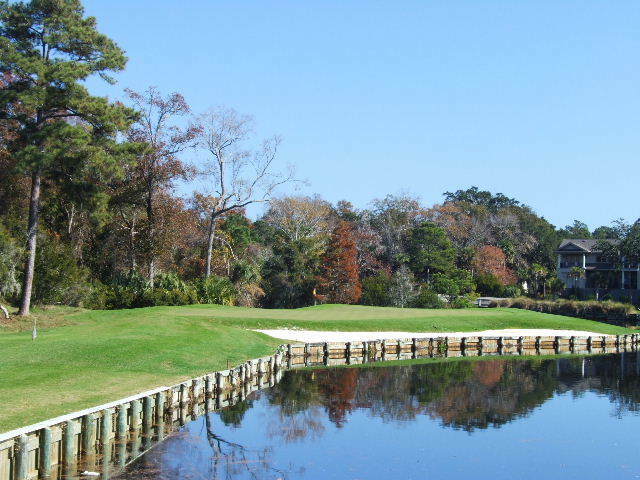 Perhaps the most prominent feature on this Hilton Head golf course is the Historic Leamington Lighthouse, which was originally known as the Hilton Head Range Light Station. This distinctive structure was built between 1879 and 1880 as part of a larger system of navigation lights guiding ships into Port Royal Sound.